Our line of natural pet toys was awarded the 2nd award in the Natural Pet Category at Global Pet Expo 2012. We own our manufacturing facilities in India (www.ajayinternational.com) and that gives us complete control over the quality of our products. We continually adapt our products to the fast changing needs of the pets market in North America. Because of our strong manufacturing base we have developed custom products for many customers. We have warehouses in Toronto (Canada ) and Michigan (U.S.A.). This helps us serve our customers in a more time effecient manner. 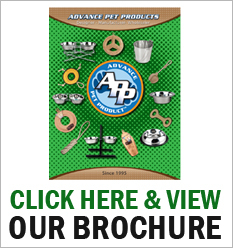 At Advance Pet Products, we strongly believe in customer satisfaction. It is our number one priority and we treat every Customer as if they are our only Customer.We regularly provide innovative products for our customers that are eco-friendly & provide great value.